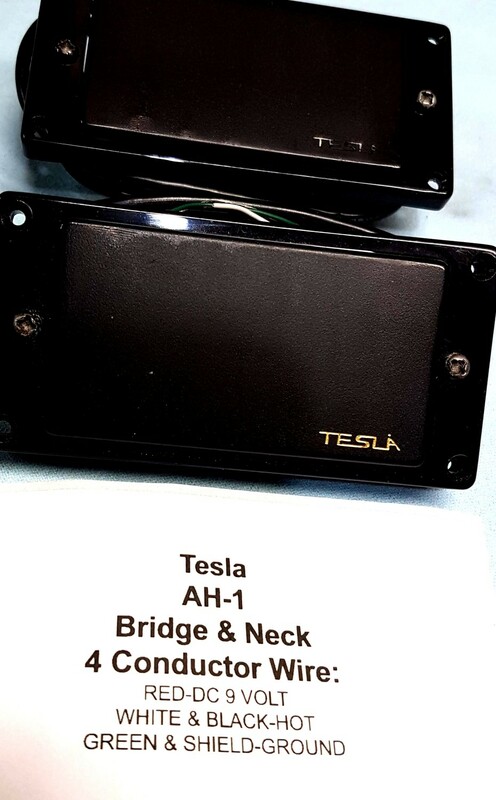 This is a set of Tesla AH-1 Active Pickups. ( used ) that are in perfect working condition and have been tested here at the shop. This versatile humbucker is designed to give you the player a very powerful pickup that at the same time is very quiet (low noise), it has a powerful crunch when you need it with clear middle tones. Its active circuits include a preamp that is powered by a 9V battery. Please take notice and read carefully, the AH-1 is a standalone type of pickup that is not compatible with any other active pickup in our line; its preamp contains a feature that simulates the vacuum tube to obtain the highest quality of tonal reproduction. The AH-1 is carefully made with American made plain enamel copper wire and bar type Alnico 5 magnets. The coils are wax potted for stabilization to insure the complete, clean reproduction of sound. Equipped with 4 wire leads that give the player endless tonal possibilities and calibrated for total tonal balance.